How many WCS patterns do you think you've ever learned? Just calculate how many patterns you learn per week, then multiply that by how long you've been dancing. Now, how many of those patterns have you actually adopted into your social or competition dancing? Oof. That's a big difference. That's a lot of money and time spent on patterns you never use, and don't even remember. And if you're a beginner, you're likely to get overwhelmed with patterns real quick unless you have a system to remember them. What if I told you you could recoup your investment, feel inspired again, and feel confident taking on more? 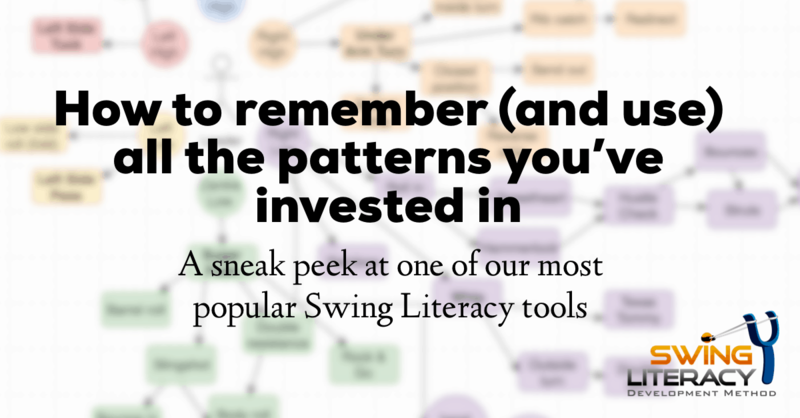 I'm going to give you a peek into our newly launched Swing Literacy Dancer Development Program and introduce you to a pattern organizer tool we use to help students organize patterns in their head so they can keep track of the patterns and stylings they learn, actually implement them in their social dancing, and open up their capacity to learn more. In order to organize and store patterns, let’s classify them so it’s easier to see the relationship between them and the techniques they share. Here's a tool we use with our students to help them set up a "filing system" in their brains for organizing pattern content. Any patterns beyond these 6 could be considered "standard" patterns, but not basics. Imagine the stickman below is the dorsal view of a leader (the leader is looking into the screen). You can see the 6 basic patterns laid out according to his orientation. The directions indicate where the leader brings his hand after generating the follower's momentum (after count 1). Passes: Right or Left, hand high or hand low. What this stickman organizer tool does is create a filing system to help your brain categorize the pathways that you will be leading your partner, which makes it easier to store new patterns. As you refine and add more technique to your patterns, it will also make it easier for your brain to reference these "files". You can add variations on to any root pattern to create a new pattern, like building with Lego building blocks. These building blocks are small, and not necessarily assigned to a certain quantity of time or beats. Like suffixes and prefixes in grammar, each Lego block is too small to qualify as its own pattern. Each Lego piece has techniques associated with it, which may or may not have been taught when you first learned it. You can also keep inserting, adding on, or layering multiple Lego blocks to make the pattern longer or more complex. This is a great way to learn how to invent new patterns, but that's not what we're here for today. At this point, you might want to grab a piece of paper. Draw a stickman of your own on a blank piece of paper. Think about all the standard patterns you do during social dancing. Maybe even dance a little bit to brainstorm. For each pattern you do, identify its root pattern. Add it on to the appropriate corner of your stickman diagram. Drooling over this mindmap and want to make one for yourself? We figured some of you would find this super valuable. We created a template for this mindmap as one of the hundreds of tools within the online Swing Literacy Dancer Development Program. Maybe looking at your mindmap, you notice that (like the map above) you lead a lot of patterns to your right, but almost never lead left-side patterns. Or that you add rock & gos wayyyy too often. Or that most of your patterns are 12+ counts long! Now's your chance to address your imbalance and refocus on other pathways. You know those patterns or moves that are inconsistent, never quite feel right, or the ones you know you fake your way through? Don't blame the whole pattern - try to identify which Lego piece is broken. These feelings are symptoms that indicate that you are missing skills for that individual Lego piece. For example, did you know that there are at least a dozen techniques pieces involved in learning the skill of "shoulder roll"? Did you ever get taught these techniques explicitly to make your shoulder rolls effective and safe? It's very common for dancers to "learn about" a move, but not really "learn how" it really works. The secret is to learn the skills to get really good at each Lego piece, so you can more effectively execute these sample patterns and any patterns you want. These start with Fundamental Movement Skills, and you can get all of them in the Dancer Development Program. Maybe you can only lead the move successfully 20% of the time. Maybe you can do the Lego piece correctly in certain patterns, but not in others. Maybe it only works with certain followers, but not others, or to slow music, but not fast. All of these indicate missing skills that you need to prioritize to go hunt down. 1. There are often "connector Lego pieces" that make the transitions between Lego pieces smoother. If you take that Lego piece to a teacher, they can help you refine it and fix it so that it can be used properly. 2. But as you know, Lego pieces are transferrable, so as soon as you fix it, you're going to open up a Pandora's box of other patterns that you've been neglecting or avoiding that will now feel better because that Lego piece is fixed! Start with the root pattern: When trying to remember a complex pattern you learned in a workshop, first identify its root pattern, then determine what Lego pieces are added to it. 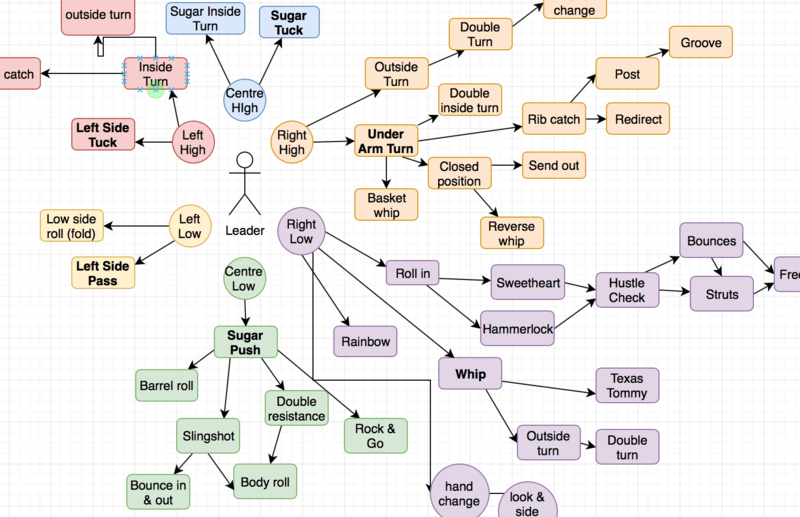 Plot in in the map (by visualizing or literally writing it down) where it would fit in your stickman diagram. Substitute Lego blocks: If you're not good at one of the Lego pieces, don't throw out the whole pattern. Substitute it with another Lego block that serves the same purpose. For example, if you can't do apple jacks, do touch-steps instead. Ignore the timing: Practice the pattern shape without worrying about the pattern timing. Take your time going through the motions and figuring out how to lead and follow it authentically with a follower who isn't "helping". Don't worry about the feet until your body gets it. FOLLOWERS: You can do this exact same process with your styling. Just plot in the map all your styling options as "variations". In the Fast Track version of the Dancer Development Program, we coach you exactly how to break down every pattern you know. We analyze your Lego pieces, clean them up, add in your missing tools, and help you rebuild and upgrade your inventory. To get started, apply for an Accelerate Your Dance Strategy Session to find out if the Fast Track is right for you. Try forcing yourself to do a whole song with only one of the 6 root patterns. This gives you lots of time to think and experiment with your Lego block variations. Pick a pattern to target. Practice dancing a regular social dance, but aim to retrieve and execute (remember and do) your target pattern once per phrase, or maybe twice per song. Think of positions you typically get to in the middle of patterns, such as shadow position, hammerlock, sweetheart, and bow tie positions. How can you get there in other ways? Which root pattern will lead up to that position? How could you get out of it? 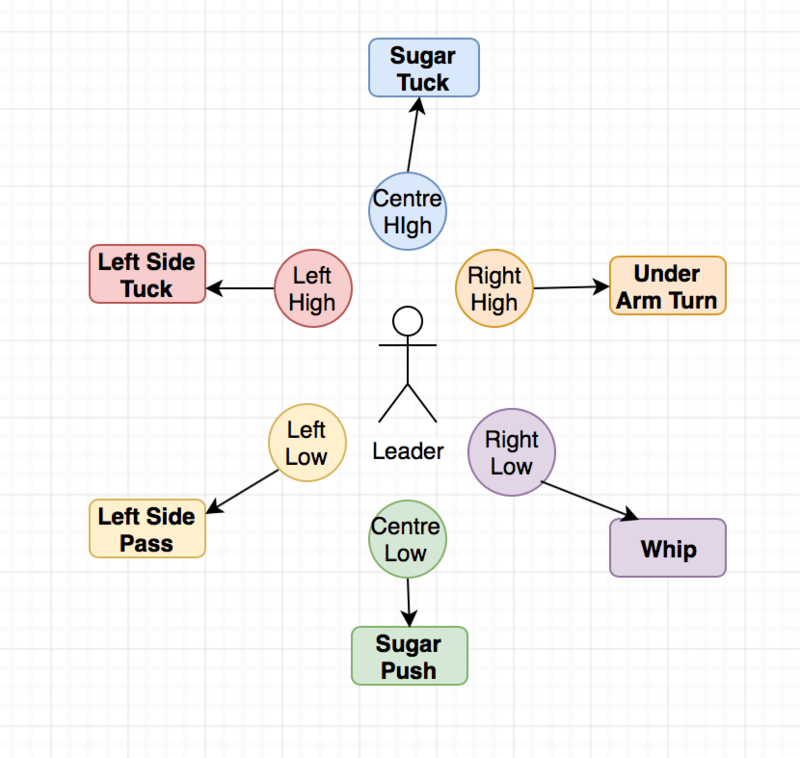 Start adding these into your Stickman diagram. In social dancing, lead the trickiest part of the pattern with intentional deceleration, then resume speed afterward. This will make the move fun to do and memorize even before it is perfected. Start today - stop hemorrhaging your moves! You've spent a lot of time learning patterns you never use. It's time to end this cycle of insanity and get a better return on your investment. *For Steps 4-7, you're probably going to want to use the Pattern Organization Tool template we created, which you can find in the Dancer Development Program. Still struggling to apply the patterns you learn? There are fundamental skills that every pattern uses that you need to be taught explicitly in class, before you attempt to apply them to patterns. Workshops assume you have these skills, and are designed to show you fun ways to apply them. But if you haven't learned your Fundamental Movement Skills yet, you will be confused, stuck, or frustrated when you can't get the pattern to work. This is not beginner-specific: it applies at every level. This is why teachers are always stressing technique, and what we focus on in Unit 3 of the Swing Literacy Dancer Development Program. When you "learn" a pattern in an average workshop, you don't learn it completely. You only learn the "Coles/Cliff Notes" version. There simply isn't enough time in a 1 hour workshop to cover all the required technical details that will make that pattern work efficiently. So what you get is a sample or introduction of something to inspire you to learn more about it. The workshop teachers may mention some tactics you need to use in order to make the pattern work, but those tactics are not self-explanatory. If you don't already know all the technique details that make the tactics work, you might need to go search them out so your tactics can function properly in that pattern. 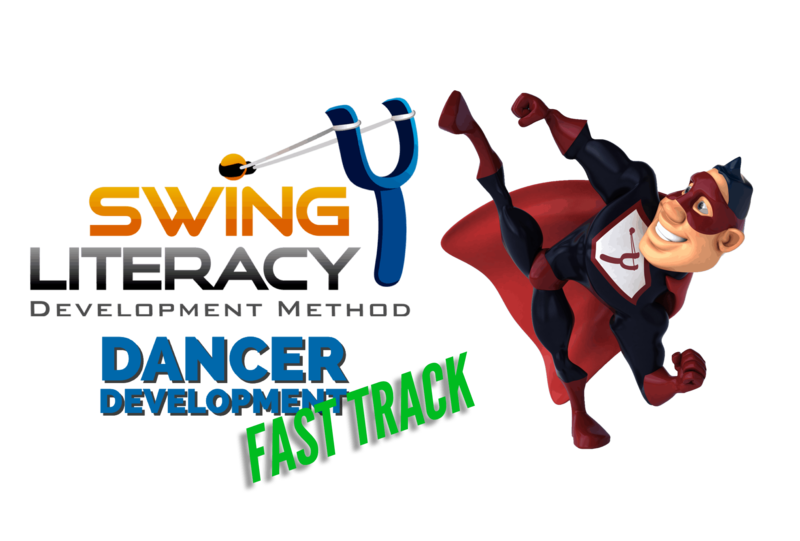 We explain all the details about Technique, Tactics and Strategies in Unit 2 of the Swing Literacy Dancer Development Program. Contrary to popular belief, good practicing doesn't mean repeating something over and over. In fact, practice reps help your body identify the muscles to fire and when, but they don't help you store new information in a way you can use it on demand. Repeated practice just embeds the skill in your short term memory, but what you need to do is move it to your long term memory. Your brain needs to practice creating the new neural pathways from scratch so they get "worn in" like a footpath in the snow. For this, you need to practice doing the pattern several times with time in between (spaced practice). We describe Retrieval Practice and other learning strategies in the Swing Literacy Dancer Development Program. Like this article? Members of our Dancers' Insiders Club get regular access to our premium content. Sign up to get more gold like this! Like this article? We'd love to hear your comments or questions below!